The Fitzroy Baths opened in 1908 with a men's pool described as the largest in Victoria measuring 175 ft by 80 ft and, separated by a wall, a women's pool measuring 76 ft by 30 ft. The Baths were Monier reinforced concrete structures designed and built under the supervision of Sir John Monash. Although the pools have been altered, they retain their original configuration with what was originally the women's pool now used as the children's pool. 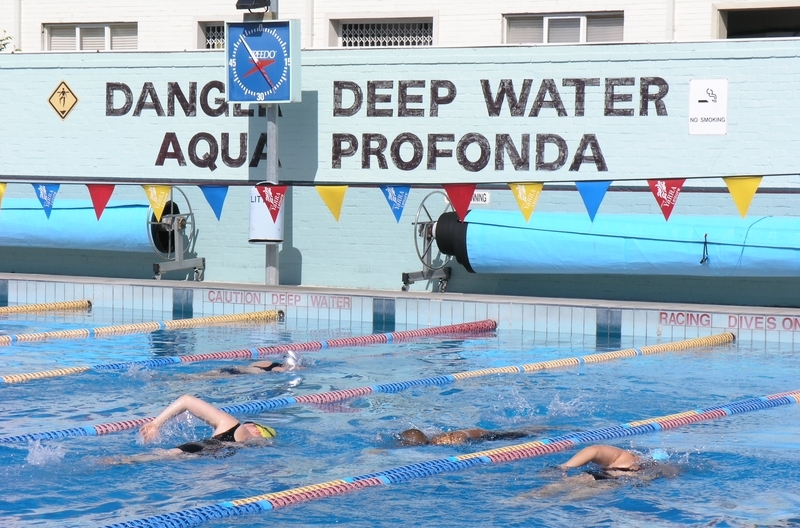 At the deep end of the main pool the words 'DANGER DEEP WATER' and underneath 'AQUA PROFONDA' are painted in black on the brick wall which runs along Young Street. The sign was painted c. 1953-54 at the initiative of the pool manager, James Murphy, who was constantly rescuing migrant children from the deep end of the pool. Mr Murphy asked an Italian friend what the words for "deep water" were in Italian and had them painted at the deep end. "Aqua" is actually a misspelling of the Italian word: the correct spelling is "acqua" ("aqua" is the Latin spelling). The 'Aqua Profonda' sign is of social and historical significance to the State of Victoria. The sign has social significance as a highly valued feature of inner Melbourne. The sign achieved iconic status through its appearance in the 1977 Helen Garner novel Monkey Grip and the subsequent film where the 'Aqua Profonda' sign served as a metaphor for the tempestuous relationship of the main protagonists. 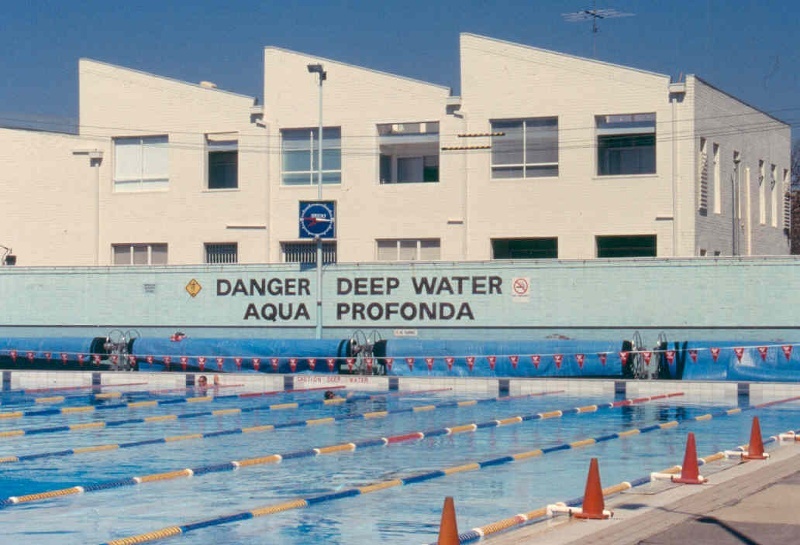 The importance of the sign and the pool to a wide community became evident during the highly successful Save Our Pool campaign of 1994-95 when the pool was threatened with closure by the City of Yarra commissioners. This campaign is often cited by writers and academics as a case study for successful grassroots campaigns. The sign has historical significance for its associations with the post-war migration program which had such a profound impact on the Victorian community. The sign is indicative of the changing demographics of post-World War Two inner Melbourne when migrants replaced a segment of the population who moved to the outer suburbs. The sign demonstrates one way in which migrants were becoming accepted as part of the community and as such is a rare tangible example of a public acknowledgement of the cultural impact of the mass migration program. The sign is symbolic of the pool as a place where the diverse population of inner Melbourne could mingle on equal terms. ÒAqua Profonda SignÓ, Fitzroy Pool, Alexandra Parade, Fitzroy, Yarra City Council. 1. 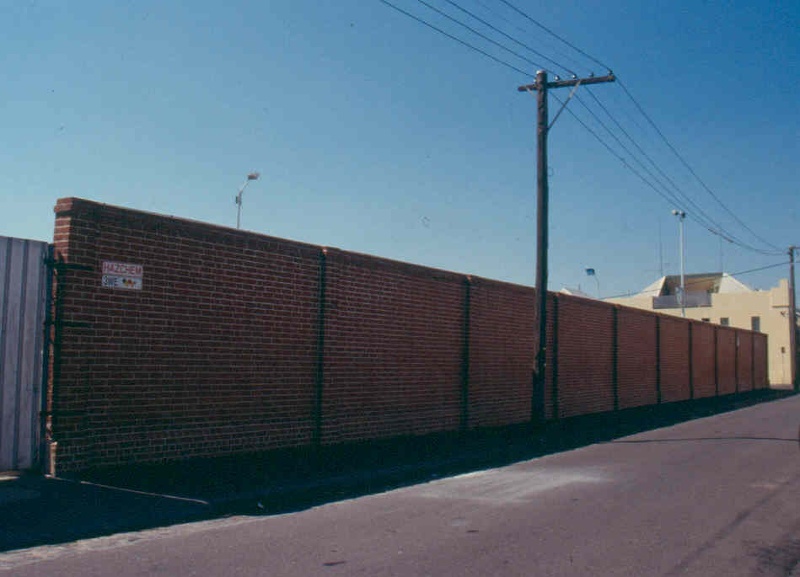 All the wall at Fitzroy Pool along Young Street containing the "Aqua Profonda" sign marked B1 on Diagram 1687 held by the Executive Director. 2. 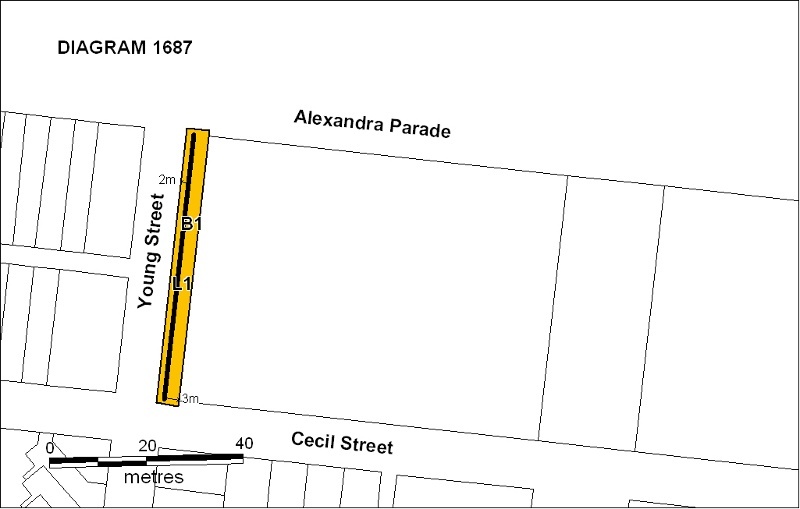 All the land extending to three metres from the base of the wall on the pool side, being part of the land contained in Certificate of Title Volume 3238 Folio 557, and land extending to two metres from the base of the wall on the Young Street road reserve marked L1 on Diagram 1687 held by the Executive Director. Fitzroy's slum reputation was accompanied by the decline in the shopping areas as central Melbourne (Bourke Street) grew stronger and modern strips were built in newer suburbs. When the Housing Commission built modern estates in outer suburbs in the post-war years some of Fitzroy's population took advantage of the new houses. Their places were often taken by post-war immigrants. By 1954 about 12% of Fitzroy's population was Italian-born; in 1966 33% were Italian or Greek-born, and Australian-born had fallen from two-thirds to one-half. The Italian-born and the population with an Irish background constituted a strong Catholic body. Within ten years, however, the numbers of Italian-born and Greek-born residents had halved and within another ten years they had halved again. Between 1947 and 1991 Fitzroy's population fell by 44%, to 17,885. The non-Australian born component, however, moved from 42% in 1947, to a high of 49% in 1966 and back to 40% in 1976 and 1986. The ethnic composition moved from noticeably Italian/Greek to a wider range, with nearly 9% from Asia. The Fitzroy Pool was opened on 21 October 1908 with a “men’s basin” measuring 175 ft by 80 ft and a “women’s basin” measuring 76 ft by 30 ft. The pool played an important role in a crowded inner city area with a high proportion of low income residents. The Aqua Profonda sign was painted on the brick fence sometime in the 1950s. Italian Historical Society Curator Lorenzo Iozzi rmembers the sign from his childhood in c.1958 (e-mail from Laura Mecca, Manager IHS). So far, research has not been successful in finding a date. Sources checked: Fitzroy Library Local History Collection, La Trobe Library, Italian Historical Society (phone discussion with Manager Laura Mecca), Fitzroy Council Minutes, PRO (c.1950-58 were checked but these are not indexed so perhaps a more detailed examination would find further information. There was a reference in March 1955 to the possibility of erecting a sign in Italian at a playground)). The word “aqua” is the Latin spelling for water while “profonda” is Italian for deep. According to the manager of the Italian Historical Society, Laura Mecca, “aqua” is probably a misspelling of “acqua” which she said is a common mistake. The sign achieved iconic status through its appearance in the 1977 Helen Garner novel Monkey Grip and the subsequent film where the “Aqua Profonda” sign served as a metaphor for the tempestuous relationship of the main protagonists. The pool became the focus of a community campaign when it was threatened with closure in 1994 by the Commissioners of the City of Yarra. The “Save Our Pool!” group were successful and the Commissioners reversed their decision. * Minor works and maintenance to the Young Street side of the wall and to the pool side of the wall which is further than 1500 mm away from the sign. The main cultural significance of the “Aqua Profonda” sign lies in its link with the post-war arrival of migrants. It has in more recent years become identified by the community as an inner city icon. It is the purpose of the permit exemptions to protect the heritage significance of the sign and the brick wall along Young Street. The sign should remain visible from the pool and poolside as originally intended. The purpose of the permit exemptions is to allow works that do not impact on the significance of the place to occur without the need for a permit. Alterations that impact on the significance of the sign are subject to permit applications. Heritage Victoria should be advised of any proposed works, including painting, to the wall and "Aqua Profonda" sign. Heritage Victoria should also be advised of any works which would impact on the visibility of the sign from the pool.